“Tonight I spent the better part of six or seven hours going over the information supplied in this document and I can honestly say it was very well written, easy to read, very informative and highly enlightening, material... I seriously think it is the most valuable free energy document ever released, as it truly establishes a VERY solid foundation to build upon. Thank you to all who made this possible! NO! That book covers a lot of advanced material about solid state oscillators, negative energy amplification and other theoretical information. Free Energy Generation does NOT cover the Bedini SG & Bedini SSG circuit in the depth that is presented in the Bedini SG handbook. This Bedini SG handbook covers the Bedini SG & Bedini SSG circuits with full how-to plans showing the EXACT specifications that John uses to build his own energizers and all other information directly related only to the Bedini SG & Bedini SSG circuits. 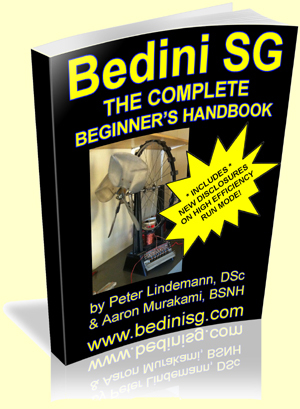 We have received an incredible response to Bedini SG – The Complete Beginner’s Handbook – thank you all for supporting John Bedini’s work! We have also received a lot of emails that ask the same questions, so we’ll answer them all at once for everyone to save time. Make sure to read the IMPORTANT NOTICE and F.A.Q.. If you purchased the book, you will have received an email with the subject “Confirm your subscription.” It is vitally important that you find that email and click the confirmation link in it. If you do not do that, you will not be able to get free updates to the book. Q – Is this information already in the Free Energy Generation – 20 Bedini-Bearden Years book? A – NO! That book covers a lot of advanced material about solid state oscillators, negative energy amplification and other theoretical information. Free Energy Generation does NOT cover the Bedini SG & Bedini SSG circuit in the depth that is presented in the Bedini SG handbook. This Bedini SG handbook covers the Bedini SG & Bedini SSG circuits with full how-to plans showing the EXACT specifications that John uses to build his own energizers and all other information directly related only to the Bedini SG & Bedini SSG circuits. Q – When will the Bedini SG energizer kits be ready so I don’t have to build it from scratch myself? A – The projected date is by the end of December. We will send notice when they’re ready. Q – I’m a Clickbank affiliate but can’t find this book in the Clickbank Marketplace. A – You have to use our custom linking system that works in conjunction with the Clickbank ID’s – go here for info A & P Electronic Media Affiliate Program just follow the 3 steps on that page. A few people have mentioned that the recommended coil winding direction in the book is opposite of what has normally been done with the classic SG for years. Basically, everyone who got this book will see something that is mind-blowing and we'll put an updated book on the download page by the end of the week explaining this. If you have the book, you have MORE than what we promised we would give you in the book... WAY WAY MORE. You just haven't seen the explanation as to what this is but we're giving it to you soon. I attach a graph from the vid -- but I cannot read the horizontal time scale. Sure would like to understand that, also the vertical voltage scale -- can you or someone help? I'll see if I can get a time scale next time I go to the shop. * NEW DISCLOSURE * on the SG Energizer Technology! This is a quick note to let you know that there is a * NEW * chapter in the Bedini SG book that explains a certain high efficiency running mode that even advanced builders with 10 years of experience have never seen before! There are other updates to the new Version 1.1 of the book and it is available all for no extra charge. If you already have a copy, login to the download page and download it. Also, the 5th Edition of The Quantum Key by Aaron Murakami is scheduled for release on December 21, 2012. I think if you post this question in the monopole forum at Energy Science Forum you might get a quick answer. I tried to purchase the Bedini SG handbook and paid through PayPal but after confirmation of my PayPal password, it came up with my olld discontinued emaill address which is no longer valid and a Password and will not recognize my new email address . can you re send to my new email addresss so that I can use the pass word given. Can i give you me new email address. It is on this site where I have now registered as I was unable to get an email address to get in touch with you. Hi Oscar, please forward your Clickbank receipt to me by email. I have a question regarding these SG books and the Bedini SG, if you could clarify it for me - I would much appreciate it. So I have say 1 front end run battery fully charged, I am able to charge more than 1 dead back end charge battery before the front end run battery is "dead". That is, 1 fully charged battery can be used to charge more than 1 dead battery. I would appreciate if you can clarify this for me as it is something that continues to be confusing when I read the book or listen to the videos of you guys talking about this technology and front end/back end efficiency. Output measurement - scoping the spikes coming out of the coil will never show what is happening. Might be lucky to measure 20% of what we measure leaving the input battery. So how do we measure what was actually used? We wait until the battery on the output is charged up and then we draw a steady C20 resistive load on it to see how many joule seconds we get before it gets back down to the voltage it was at before the charging. Let's say we measure 900,000 joule seconds. That means minus any charging losses (heat in battery, which should be almost non-existent if the battery is low enough impedance) - so 100,000 joules were lost in the resistors, transistor, coil, diodes, etc... This is the only honest way to measure what our recovery is. So, we have 1,000,000 in but we recovered 900,000 in provable joule seconds or watt seconds of energy that we were actually able to dissipate from the output battery after being charged so that is 90% recovery. If we're running in attraction mode, we have measured mechanical work between 30-35% in watt seconds equivelant meaning that 90% recovery of COP 0.9 + 0.3-0.35 = 1.20 to 1.25 COP. Another way to look at it is that our net loss was 100,000 watt seconds - our cost to product 300,000 to 350,000 watt seconds of mechanical work. That is actually a COP of 3.0 to 3.5 when we account for what was actually dissipated in electricity. Yes, the battery can charge quicker but when conditioned with the spikes - if that is what you're charging a battery with, over time, it will charge faster and faster and faster until it hits a plateau. Self recovery is also more than the usual small self-recovery by normal charging. The capacity can easily be increased 10% above manufacturers rating. The battery powers a load longer from an equivelant resting voltage of a normal charged battery. Here is where the "overunity" shows up in the batteries (not counting mechanical work). At John's shop during the golf cart tests... they were charged and discharged nonstop 5 days a week with weekends off. During the week, there was an anomalous amount of energy that can be drawn from the battery compared to what went in. On Monday, that didn't happen, it was what was expected. But during the week when there were no breaks during charge/discharge cycles, the batteries would deliver more watt seconds of real dissipated energy than what left the power source. We saw this over and over for months and they still have all the graphs. That was around 2004 when Peter was working at that particular location with John. I was always stopping by so watched this quite a bit myself. Most people never see it because they don't do these kind of non-stop drawn out tests without breaks. The other "overunity" was that some of John's machines had 4-5 batteries on the back end. 3-4 would just stay there an he would swap just one on the back with the front and could keep doing that indefinitely. That particular system did charge a cap and discharge it back to the front end. Normally a battery doesn't like to be charged/discharged like that, but it worked and it kept itself charged up. He did that with a few machines - that basic variation at least.